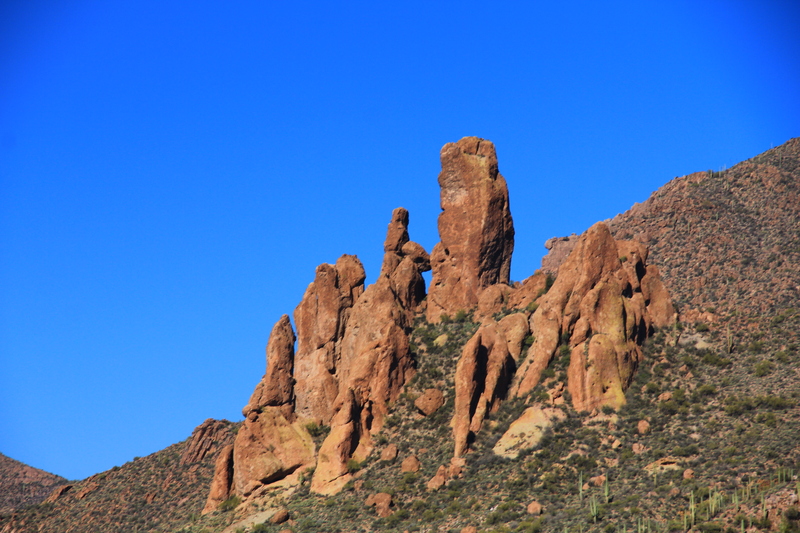 For a long time I’ve wondered about a trail called “Coffee Flat Trail” which veers off the Lost Dutchman just below Miners Needle. It leads to a place called “Dripping Spring” in the far reaches of Barkley Basin. Today Tony led us there on the first of his “distance challenge” hikes for this season. 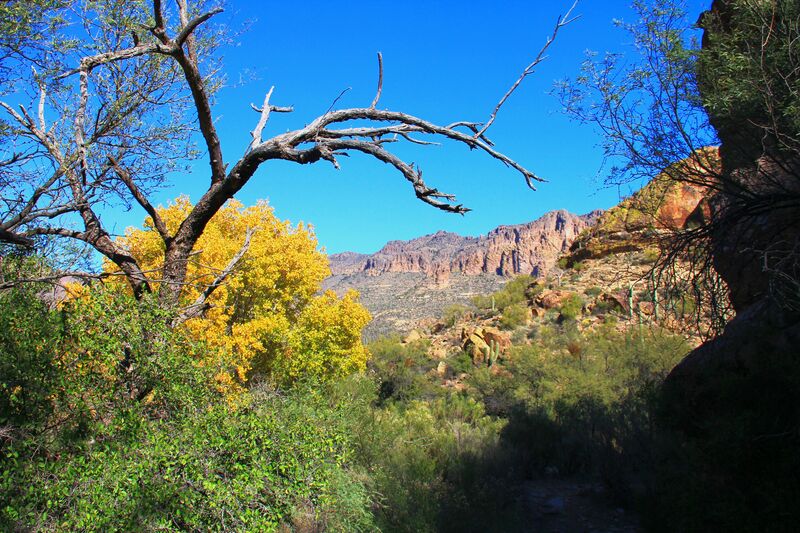 Hiking Arizona lists this as a 7.5 mile trek (15 miles round trip). The first segment of the trip is familiar to our club, the hike out of Peralta trailhead along the north side of the Barkley Basin to Miners Needle. After a short ascent out from the trailhead, this trial is an easy rolling route along the north side of Barkley Basin. 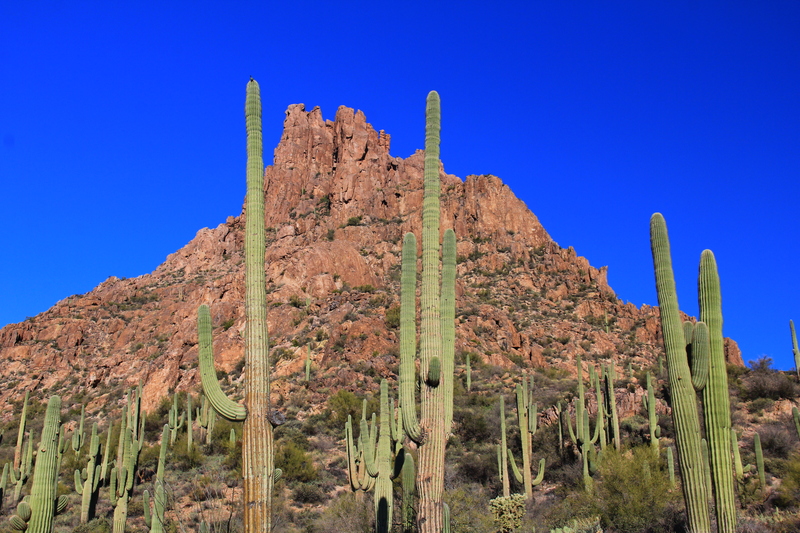 This area seems to be saguaro haven as it is the dominant plant, and the scenery is dominated by striking volcanic formations, the most prominent of which is Miners Needle. At the base of this mountain is the junction with Coffee Flat trail. It crosses the basin southward, and commences a gentle ascent of the southern slopes and then heads eastward. 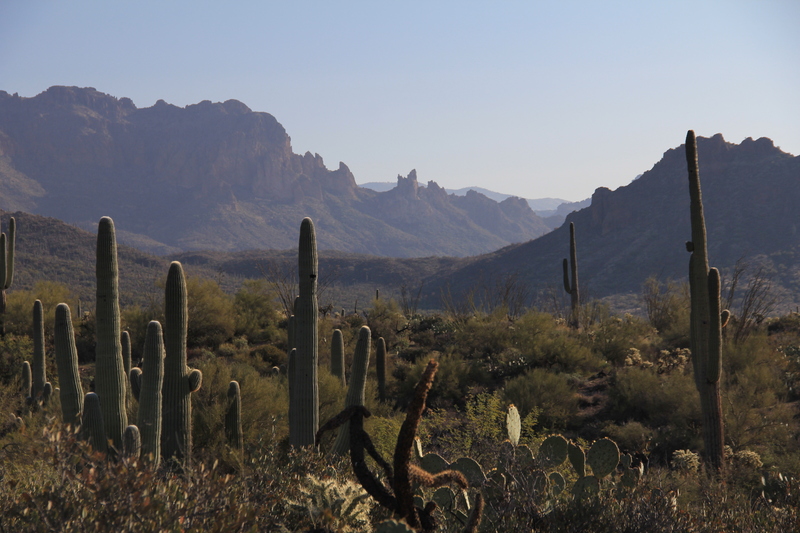 The nature of the northern slope continues to be dominated by spires and saguaro, but here on the southern slopes (north facing) sagauros are absent, replaced by a mix of mesquite, palo verde, and ocotillo. The morning sun to the east (our line of travel) made photography “hazy” but here is what the path ahead looked like. We eventually, over a series of ridgelines, will circle to the left of that formation on the right of the photo, then down into another basin behind it. This basin is the Dripping Springs area, and it is completely different in character. The first glimpse of the change was this view down into the canyon below, showing a grove of cottonwood trees in the fall colors. 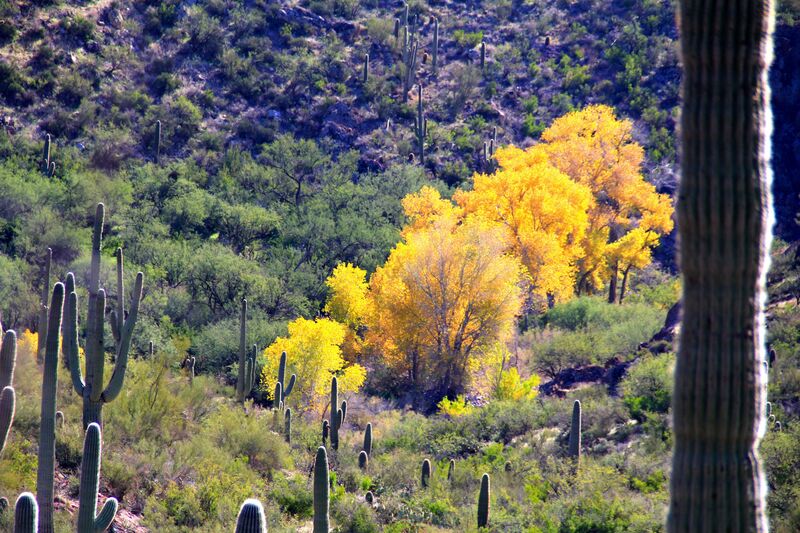 After the dominant browns and greens of the desert, the effect was striking. This is an active ranching area, with good water supplies. 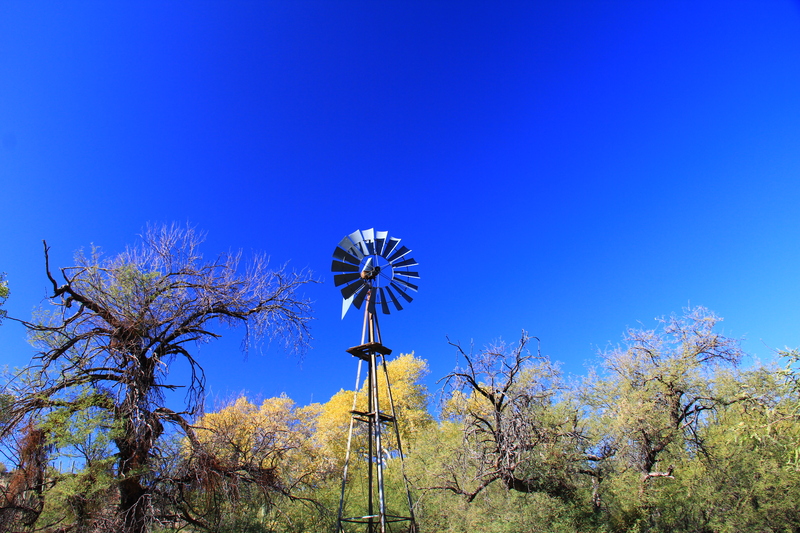 There were a couple of windmills in the vicinity, and running water in a small stream. All in all, a pleasant place to enjoy our lunch before the long trek back to the trailhead. Always love your commentary (and your beautiful pics, too, of course!) explaining where we went and what we saw! Thanks, Hans! I can tell the new camera was along on this hike. Nice photos. Nice commentary. A few people brought their GPS units along to double check the distance. It turned out to be approximately 11 miles. Thanks for your wonderful pictures and commentary. When I look at the cactus they bring to mind a troop of soldiers guarding the beauty Mother Nature and God provides. They do bring that image to mind sometimes. Silent observers.